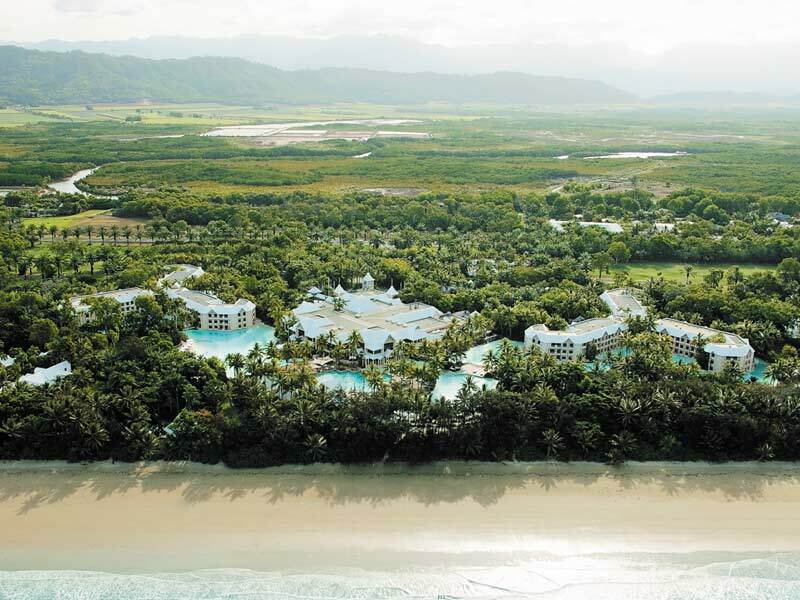 Hidden amongst the lush tropical greenery of Port Douglas you will find the Sheraton Grand Mirage Resort Port Douglas. 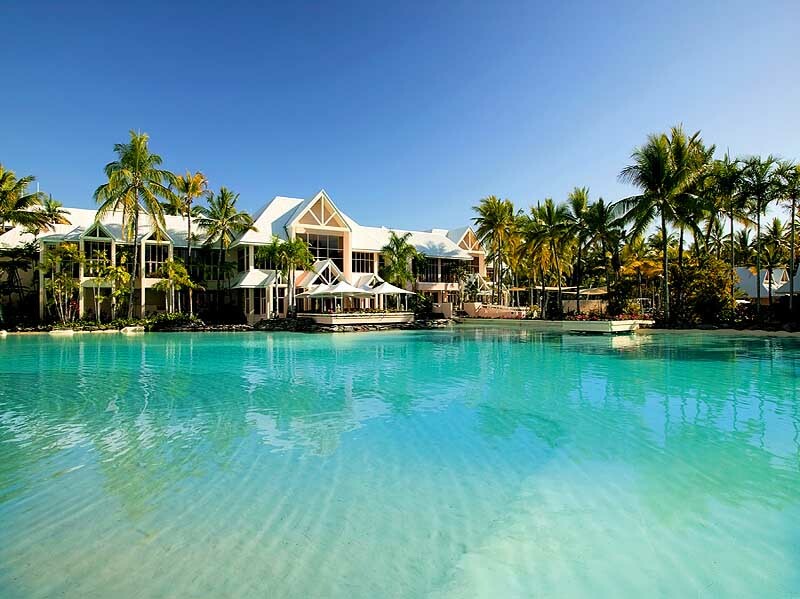 Tropical North Queensland is one of the most inviting destinations in Australia. 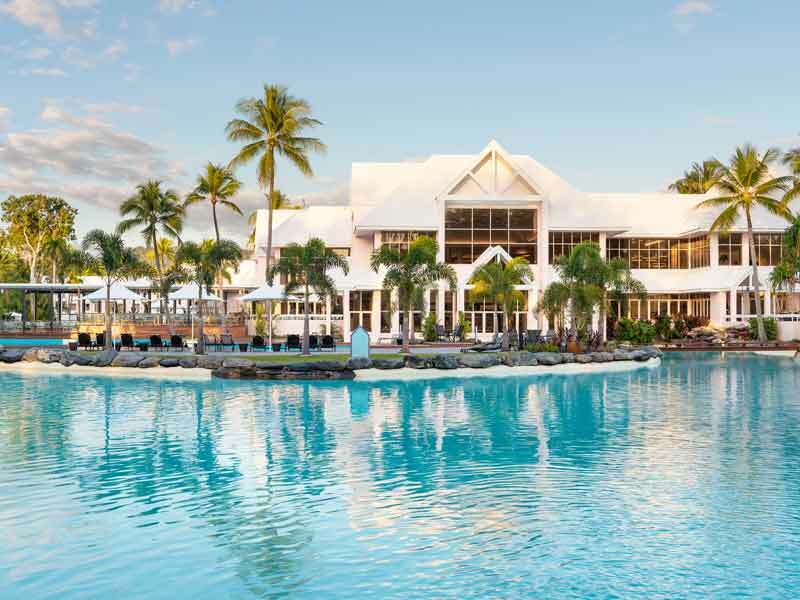 The sun shines all year round, with plenty to do and see the Sheraton Grand Mirage Resort Port Douglas invites you to host your next adventure, family holiday, or special occasion. 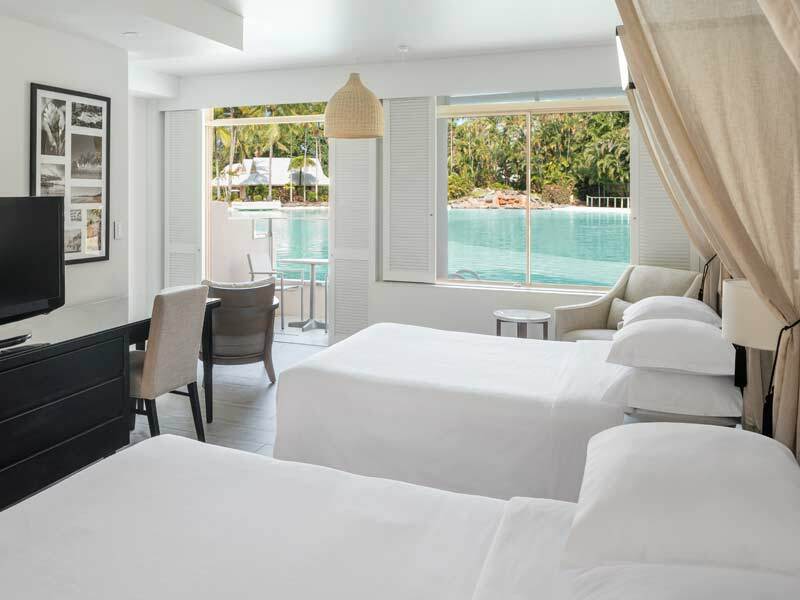 Upon arrival at the grand entrance of Sheraton Grand Mirage Resort Port Douglas, you will be treated like a VIP with impeccable service and welcoming smiles. 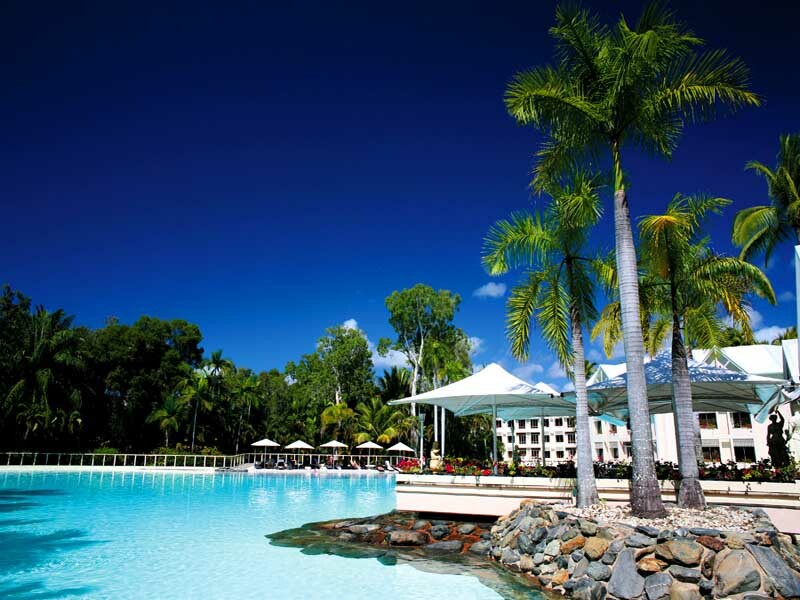 Sheraton brand hotels around the world are known for their elegance and luxury, and the Sheraton Grand Mirage Resort Port Douglas is certainly no exception! There are 6 separate accommodation blocks across 147 hectares on the stunning Four Mile Beach location. Each of the freshly transformed rooms and suites feature a spacious layout that was designed with your comfort and convenience in mind. The Sheraton Signature Sleeper beds provide a heavenly place to lay your head for a relaxing night sleep. There’s Wi-Fi to keep you connected, air conditioning to keep you cool and TV entertainment systems to keep you amused. 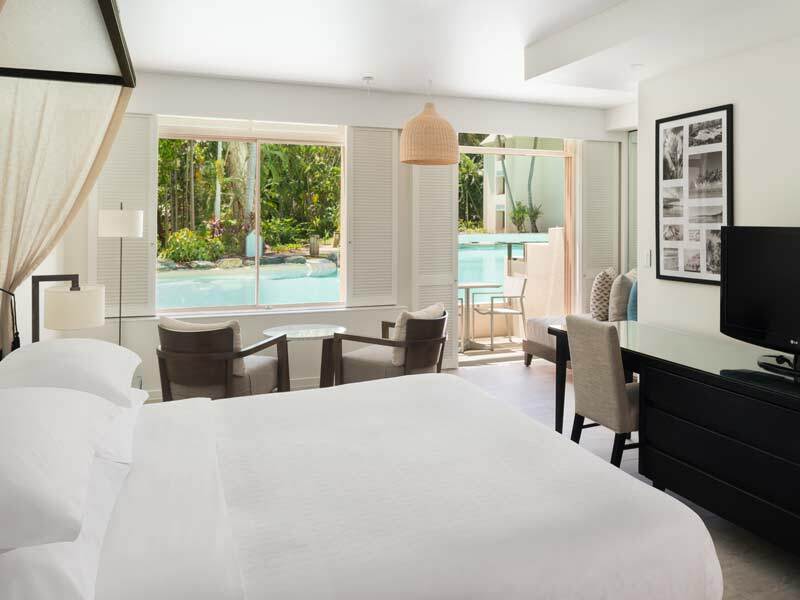 The 5-star luxury is evident in every corner of Sheraton Grand Mirage Resort Port Douglas and it doesn’t stop at the selection of facilities and services nestled amongst the 130 hectares of tropical bliss. Home to the Mirage Country Club, you’ll find everything you need to keep active here. Golfers can practice their swing while admiring the stunning views of the Coral Sea on the clubs 18-hole golf course after getting their hands on the latest golfing fashion at the Pro Shop. If golf isn’t your sport of choice, there is a tennis court, a 25 metre lap pool and a gymnasium equipped with Life Fitness equipment for guests to utilise too. Feel the soft sand between your toes with direct access to Four Mile Beach or take a dip in one of the outdoor swimming pools. When hunger strikes make your way to Feast Restaurant and tantalise your tastebuds with a range of authentic Australian and International tastes from the buffet or a-la-carte menu. 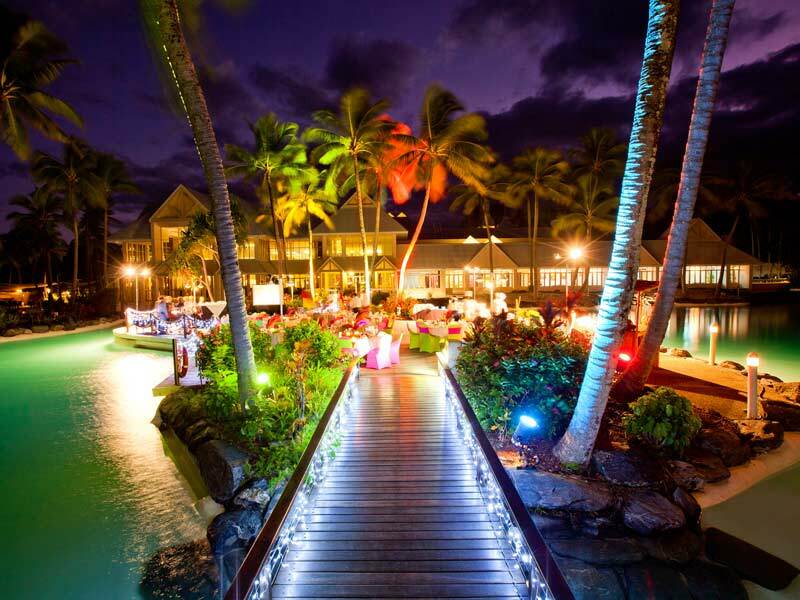 Why go to Sheraton Grand Mirage Resort Port Douglas? 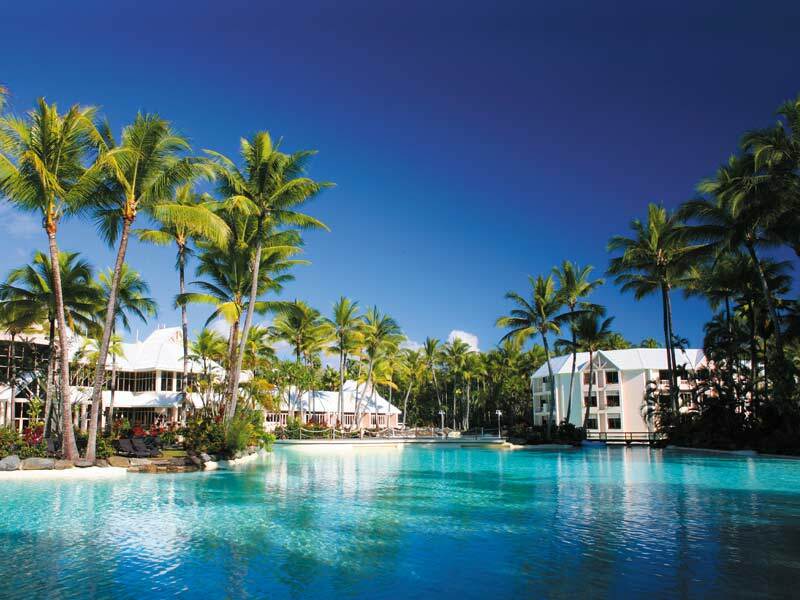 With its opulence and indulgence, the Sheraton Grand Mirage Resort Port Douglas is an ideal holiday resort destination. Whether travelling as a group, with your family or just on a romantic week away, we have Queensland holiday packages to meet your needs and budget. With views of the lush tropical gardens, the Mirage Resort Room were refreshed in 2016 and can accommodate up to 4 guests in the 42sq. metre space. Rest easy on the signature Sheraton beds, available with either 1 king bed or two double beds. To keep you entertained, these rooms are fitted with a flat screen TV entertainment system, Wi-Fi access and an integrated communication & audio phone hub. Control the climate in the rooms with air conditioning and ceiling fans, keep your valuables secure in the in-room safe and chill your drinks in the mini bar. With postcard perfect views over the saltwater lagoon pools, the Lagoon Room will surely delight all guests. The room features the famous Sheraton Sweet Sleeper Beds, either one king or two doubles, along with a Flat Screen TV Entertainment system, integrated communication & audio phone hub and climate control air-conditioning. The rooms also feature Wi-Fi to keep you connected, in-room safe for your valuables, a mini bar and more. The 42sq. metre spaces makes for enough room to accommodate up to 4 guests. Enjoy the stunning views of the sparkling saltwater lagoon pool from the Lagoon Edge Room. Jump into the refreshing water from your swim out balcony with direct access to the lagoon pool. With luxuries such as signature Sheraton Sweet Sleeper beds, flat screen TV entertainment system, integrated communication and audio phone hub, climate control air conditioning, you’ll truly feel like you’re in paradise here. The rooms boast 42sq. metres of spaces and can accommodate 2 guests with the king bed configuration or 4 guests with the double beds configuration. 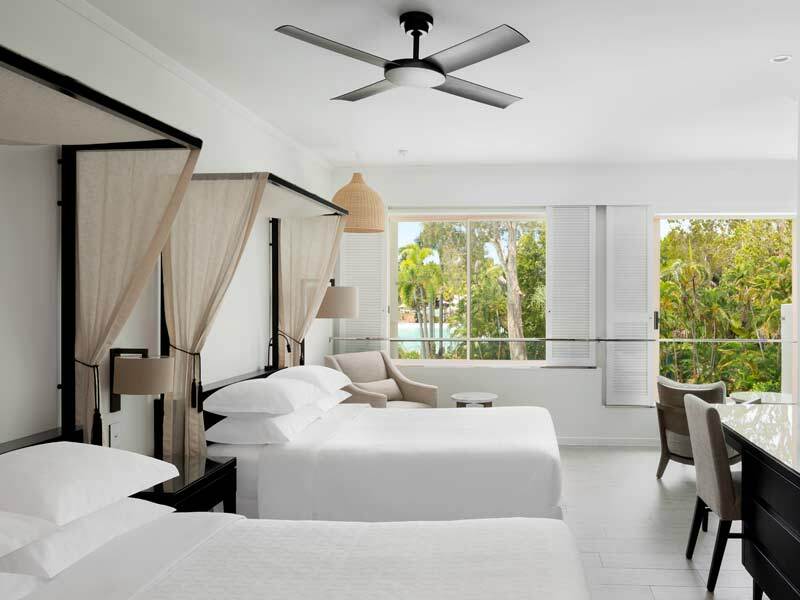 The newly renovated Mirage Studio Suites feature a stunning interior complimented by the tropical garden surroundings. The rooms are a generous 52sq. metres and are equipped with a king-sized Sheraton Sweet Sleeper Bed, climate control air-conditioning and a flat screen TV entertainment system too. There is Wi-Fi access to keep you connected, an in-room safe to keep your valuables secure, a mini bar and much more! Wake up to incredible saltwater lagoon views in this spacious suite. Boasting 52sq. metres of space, Sheraton signature king bedding, Wi-Fi, a flat screen TV entertainment system and more, you’ll be able to bask in the interior luxury and your cares float away! Lagoon Studio Suites are beautifully light-filled and feature large opening windows and a furnished outdoor sitting area. They can accommodate up to 4 guests. Stay right on the water and make the most of the views! Lagoon Edge Studio Suites are perfect for those who want to take the plunge, with swim-out balconies offering direct access to the saltwater lagoon. Inside, spread out and enjoy 52sq. metres of space, Wi-Fi, air-conditioning, ceiling fans, Sheraton signature king bedding, an integrated communication and audio phone hub, flat screen TV entertainment system and more! Lagoon Edge Studio Suites can accommodate up to 2 guests. 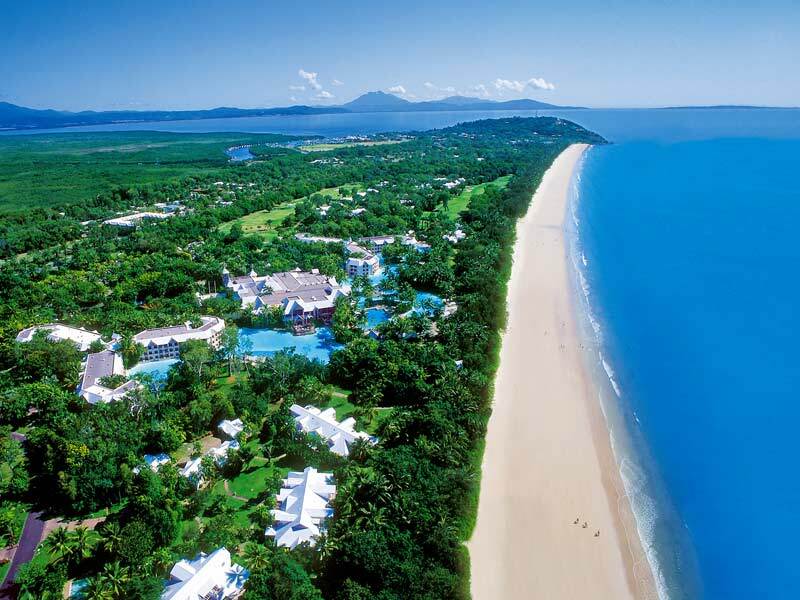 Sheraton Grand Mirage Resort Port Douglas is situated on the iconic Four Mile Beach in Port Douglas, about 70km north of Cairns. The location is prime for exploring the best of North Queensland with close proximity to Marina Mirage (gateway to Great Barrier Reef), Mossman Gorge, Skyrail Rainforest Cableway and more! 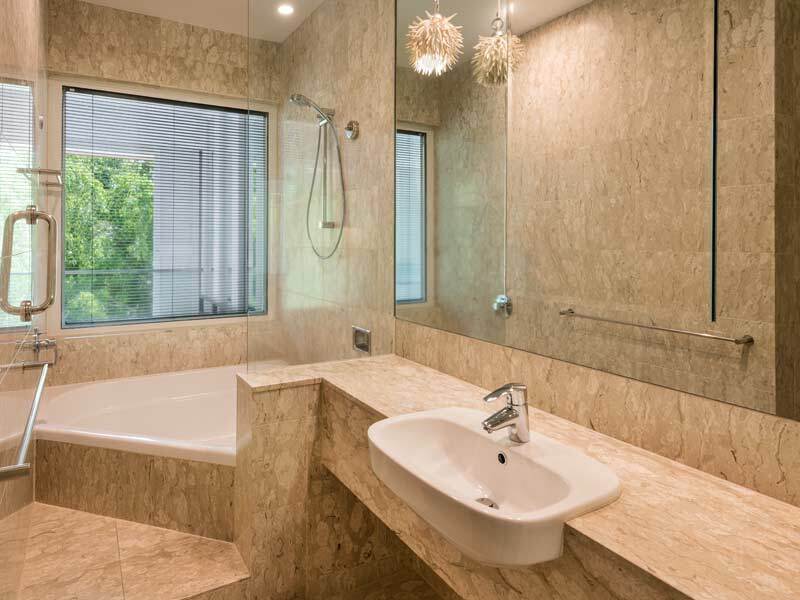 Finding something to keep you busy at Sheraton Grand Mirage Resort Port Douglas is easy! Guests could easily spend days making the most of the facilities at Mirage Country Club. There is an 18-hole golf course bordered by the Coral Sea where guests can challenge themselves to a combination of 6 par 3, 6 par 4 and 6 par 5 all within the very diverse holes. Before you head out to practice your swing make a stop at the Pro Shop where you’ll find a range of the latest golfing fashion from designer brands like Calvin Klein, Cross and Oakley. Challenge your travel companions to a game of tennis or keep your fitness schedule up to speed at the equipped gymnasium and lap pool. Soak up the warm afternoon sun from the soft sands of Four Mile Beach or relax on one of the cabanas around the lagoon swimming pools. Ask the friendly team for assistance booking tours and activities away from the resort. Spend a day bush bashing through the Daintree or Kuranda Rainforests, bask in the sun as you kick back on the beach, or go out for a day- or overnight-trip to the Great Barrier Reef for some interaction with the local marine life! I was beyond impressed with the Sheraton Grand Mirage in Port Douglas. The grounds were amazingly beautiful with gorgeous pools & landscaping throughout. Direct access to Four Mile Beach & only a short walk from town really allowed for the best of both worlds on our vacation. We were truly able to relax as the staff were super attentive from the moment we checked in until we unfortunately had to leave. If you are visiting Port Douglas, this is the place to stay!